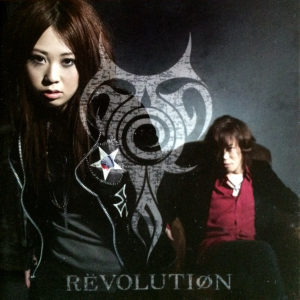 RЁVOLUTIФN is the first album from the duo TËЯRA (TERRA), consisting of composer Naoki Maeda with composer and vocalist jun (Junko Karashima). The album contains remixes and extensions of many of their tracks from various Bemani games, as well as one new composition. Most tracks receive a new verse or bridge, along with some changes to the arrangement. There is also a second disc containing a non-stop megamix of the songs from the album. Though the album has nothing really unexpected from the duo, there are plenty catchy J-Pop tunes and energetic arrangements to be found on the album. TËЯRA is most well known for their so-called ‘Hyper J-Pop’ tracks, and several are present on this album. These tracks are a combination of fast tempos, synths, and rock elements. For the most part they can fairly generic and similar, but a few elements can set them apart and they are reasonably energetic. The first of the bunch “STARS☆☆☆” is an extension of the original from pop’n music 8, and is more beat-driven than most of the other tracks. Its stronger reliance on space-y synths set and its strong melody set it apart from many of the others. “ULTiMΛTE” is another strong track with many different elements, and also benefits from a clean-up in sound from its original. “1/6billionth” and “North Wind” are a bit less notable, but “DoLL” is easily one of the best tracks of the album, with a stronger progression of sound throughout and a dynamic arrangement. Its emphasis on piano is welcome, and although the new piano solo outro seems a a bit out of place, it doesn’t diminish the overall great track. Aside from the Hyper J-Pop tracks, there are other songs but a few of them are quite similar. “WE ARE” and “ESCAPE TO THE SKY” are all the standard J-pop-rock fusion, though “Infinite Light” makes things more interesting with its heavy use of traditional instruments. The extension for “Infinite Light” is also quite good with some new melodic lines, and I particularly liked the reduction then rebuilding of sound at the second verse and bridge. “Raspberry♡Heart” is an unusually bright and happy track for the album, and though it has a fairly fun arrangement, it may put off some listeners due to its overly nasal cutesy vocals. The newly composed track “Holy Bell, Ringing in the City” is the only ballad of the album, taking on a wintery arrangement laden with chimes, bells and a moderate tempo. Everything about the arrangement can be a bit cheesy, but it’s got a strong chorus, and a decent build-up to it as well with some great lines in the verses and a decently fleshed out composition (for a pop track, that is). Some of the tracks are covers of other songs composed by Naoki Maeda originally for other singers. “ever snow” was originally sung by Yoma Komatsu, but jun’s voice sounds much more mature and clear, and is better overall for the track. The arrangement has also been polished up a bit, and among the J-pop-rock tracks of the album it is one of the better ones. “「Termination」 (Album Version)” originally sung by Yuko Imai is moderately paced track that features a soulful sax solo. jun does fine here as well, and the new arrangement also has a bit of synth added to fill it out more. Then there is “Blue Impulse” and “BABY, BABY GIMME YOUR LOVE” both newly arranged here by Sota Fujimori, and originally sung by Miyuki Kunitake and Robbie Danzie respectively. “Blue Impulse” is an expansive new arrangement that is very clear and crisp with classic Fujimori synths, and has some great instrumental moments throughout the long arrangement. The new vocals work here the best, being much lighter and better suited to the new arrangement. The “BABY, BABY GIMME YOUR LOVE” arrangement is still R&B, but is more populated by synths. Fujimori makes the track sound fairly intriguing and unique, and it doesn’t feel overlong even at ten minutes. It’s a shame that jun’s voice isn’t quite as soulful as in the original, but I don’t mind it for the track, and many of Danzie’s ad libs and backing vocals are still present. It’s a nice break from the rest of the album, and the verses are great, even if the chorus doesn’t do much for the song. Lastly, the album has a non-stop megamix of the album tracks on a separate disc. Most of the songs are in their original arrangements and lengths, so if anyone missed the original “Blue Impulse” or “BABY, BABY GIMME YOUR LOVE” arrangements, they are here albeit with jun’s vocals. Unfortunately, the fact that they didn’t change up the arrangements means that they are rather lazily stitched together with little flow between the tracks and many abrupt changes. There are also many intruding sound effects throughout, as the mix mimics an extended DanceDanceRevolution play session. They don’t ruin the mix, but as a whole the mix seems rather unnecessary and doesn’t add to much the package. RЁVOLUTIФN is a solid effort from the TËЯRA duo that is sure to satisfy fans. Although it is at times fairly generic as far as J-pop goes, Maeda often employs catchy hooks along with his energetic arrangements, and jun’s vocals are great for the most part. It’s a fairly packed album, and the extensions to the tracks all sound fine and aren’t too redundant. The megamix is unnecessary, but there is enough value in the first disc. Anyone who has enjoyed TËЯRA’s works will enjoy the album, though it isn’t likely to sway others if they have any aversions to J-Pop. Posted on September 12, 2015 by Christopher Huynh. Last modified on September 12, 2015.